Dollops of Diane: New Bunk Beds! I've been putting off moving Daniel (3) out of his crib for a while now. Like my other kids, he's always been content in his crib and would probably stay there until college if we let him. I was also dreading it since we have had two twin beds in that room before when Isabelle and Henry shared it and it's a tight fit. 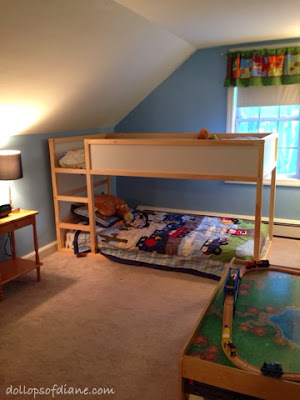 I never thought bunk beds were an option since we have low ceilings upstairs. However, my friend (Hi, Erika!) recently got bunk beds that are a loft style on the bottom for her house and I fell in love. So one trip (well, two trips actually) to Ikea and a day of building later - we have new bunk beds for the boys! They are SO excited. The kids spent the day bouncing and jumping while we spent the day yelling at them to stop. So wish us luck in our new endeavor of avoiding broken bones. Oh, and this will be Daniel's first night not in a crib in his life so...send some extra luck our way for peaceful slumbers tonight!